Die regionale Entwicklung Zyperns und die Veränderungsprozesse auf der Insel sind ein spannendes Thema das im Rahmen des Projektes Zypern von SCIEM 2000 in den letzten Jahren untersucht wurde. Louise Maguire bearbeitet in diesem Buch materielle Kultur mit einer neuen Methode, indem sie die Dekoration bemalter Keramikwaren einer minutiösen Merkmalsanalyse hinsichtlich der Linienführung unterzieht. Die äußerst detailreiche Studie ist ein frischer Ansatz um grundlegende technologische Entwicklungen zu entwirren und erweitert unsere Kenntnisse über gesellschaftliche Vorgänge während der Mittleren und Späten Bronzezeit auf Zypern. 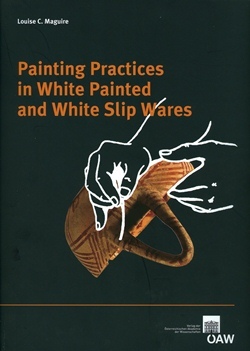 Die analysierten Warengruppen sind White Painted Wares (WPII – VI, inklusive Variationen), Proto White Slip und White Slip Wares. In dieser Studie wird deutlich sichtbar, dass Aufschlüsselungen von Waren nach unterschiedlichen Bemalungspraktiken neue regionale und chronologische Interpretationen erfordern. Das Buch enthält 4 Textabschnitte, mit detaillierten Beschreibungen und Interpretationen, sowie 72 Abbildungen und 15 Farbtafeln. The regional development of Cyprus and the on-going changes on the island are highly interesting topics, which were investigated in several studies in recent years by the SCIEM 2000 Cyprus project. This book by Louise Maguire represents a new departure from the traditional analysis of material culture; she has analysed pottery decoration by looking at traces of painting practices. This very meticulous and detailed study is a fresh approach which may help to disentangle some crucial technological developments and expand our knowledge of social behaviour on the island during the Middle Cypriot and Late Cypriot periods. The painting practices of White Painted Wares (WP II – VI and their variants), Proto White Slip and White Slip Ware have been painstakingly deconstructed. It is evident from this study, that the discovery of different brushstroke behaviour across the ware groups, has an impact on current regional and chronological interpretations. The book consists of 4 sections describing individual items from each ware group, conclusions and contains 72 figures and 15 colour plates.